Marine mammals and sea turtles spend their lives in the ocean, allowing only brief glimpses into their intriguing world. Unfortunately, these amazing creatures sometimes end up on our beaches, sick, injured, or dead, or become entrapped and unable to return to their natural habitats. These events are called “strandings.” They can be due to natural causes or, sometimes, human interactions. Stranding events provide unique opportunities for scientists to examine animals that are difficult or nearly impossible to study in the wild. 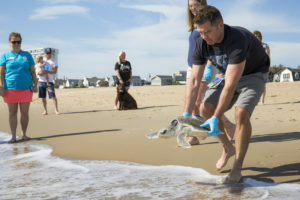 The Virginia Aquarium & Marine Science Center’s award-winning Stranding Response Program is led by a group of trained staff and volunteers, their Stranding Team. These dedicated individuals respond to stranded marine mammals and sea turtles along the Virginia coastline and beyond. 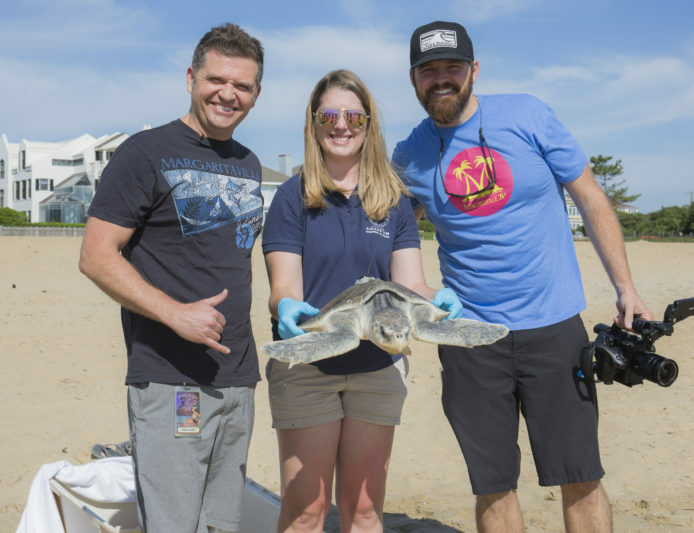 They work at the Aquarium’s Marine Animal Care Center in Virginia Beach to rescue and rehabilitate live animals, investigate mortalities and collect data from dead specimens, and conduct research on stranded marine animals. Through their passion and commitment, the Stranding Response Team serves as environmental ambassadors, educating the public about these magnificent marine animals and their conservation needs. In May, members of Jimmy’s road crew went to the Aquarium to see the work of the Stranding Team first hand. Here is a brief glimpse into the guys’ visit with Burnt Sienna and the Stranding Team. Unfortunately, Burnt Sienna’s transmitter isn’t working properly, so we haven’t been able to track the turtle. One of the team’s senior scientists suggested a faulty battery may be to blame. So even though we can’t find Burnt Sienna, follow some of the other turtles released by the Aquarium here. Since the program’s inception more than 20 years ago, the Stranding Response Team has responded to more than 2,700 marine mammal and 4,000 sea turtle strandings. 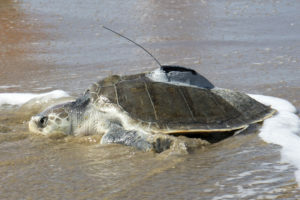 Averaging nearly 350 per year, strandings in Virginia have included: four species of seals, including harbor and harp seals; 27 species of cetaceans, including harbor porpoise, bottlenose dolphin, humpback whale and right whale; Florida manatee; and five species of sea turtles, including loggerhead and Kemp’s ridley. The Stranding Response Program is supported entirely by donations from the community, corporations and grant-making organizations. You can make a tax-deductible donation to support this vital conservation work through the Virginia Aquarium & Marine Science Center.